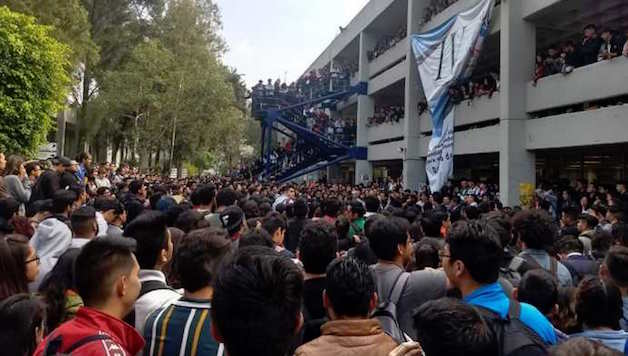 In the last few days, a massive student movement has rocked Mexico, in an inspirational show of strength by the student community of UNAM (main Mexico city university) and other campuses which have joined together to expel the fascistic “porros” groups from campuses. More than 39 campuses have voted democratically in mass assemblies to strike for between 24 and 72 hours. The atmosphere reflects the enormous confidence which the student movement has won following the historic defeat of the right wing and election of AMLO in the elections on 1 July. These elections reflected the huge social discontent accumulated over years and which had been expressed in dispersed but very militant struggles. The student movement shows, yet again, not only the anger but also the revolutionary potential of the youth. On 3 September, the movement was the victim of a provocation. Around 50 “porro” thugs interrupted a demonstration of young people who were demanding, ironically, greater security on campus, and end to repression, feminicide and a list of demands against fees, violence and authoritarian authorities in schools and universities. The attack left 6 students injured, 2 of whom are still in a grave condition. The “porros” are shock groups which originated from the “porras” (groups of ultra-football hooligans), but in reality they are a cover for gangs in the pay of university authorities. Trained and controlled by high-ranking functionaries and politicians, they have played a historic role in violence to dismantle the student movement and its most important leaders. In reality, they are very weak. The premeditated attack we suffered on 3 September was responded to with courage and strength by the movement, who pushed the thugs back forcing them to leave the campus. Now, with the strength which the spread of the movement has shown, we must to continue until these groups have been definitively expelled from the UNAM. The pressure of the movement has been felt in the academic management of UNAM already. A recent declaration by Enrique Graue, rector of UNAM, condemning the events and announcing the expulsion of 18 of these thugs from the university, is a first and great victory for the movement. Noone has gifted us anything and this reaction is a result of the struggle of the students and the strikes that have taken place. Despite this first victory, we must continue the struggle and say this is NOT ENOUGH. The most notorious associate of the “porros”, Benjamin Barajas, a known promotor of the gangs, continues to be in the management of the College of Science and Humanities. We demand his immediate expulsion from any office in UNAM. It is also essential to denounce the actions of UNAM security and demand the sacking of Teofilo Licona (known as “the cobra) who was responsible for allowing the attack to take place on 3 September. The rector must implement these demands or step aside. The problem must be solved at its root. We need a democratic university, which allows for the free expression for students, critical thinking, and the real development of young people in a safe atmosphere without harassment or violence. High ranking officials should be elected from below with the participation of all the university community. No more corrupt and authoritarian functionaries! If we do not remove all of these instigators of violence, the “porros” will regroup sooner or later. No student should be obliged to pay a fee to attend university, as has been taking place in campuses like CCH Azcapotzalco. Free university is a result of the taxes paid by millions of workers and youth. The money for quality education exists, but it is badly distributed, and spent on corruption and sky-high salaries for the top management. The demonstrations of solidarity have been magnificent and the solidarity strikes which have taken place throughout the country show the massive potential of this movement. It is totally possible to build a national struggle against violence against young people, victims of the so-called “war on drugs”, of feminicide, of fascistic gangs and crime. The structural violence we suffer under capitalism can only be stopped through mass, conscious and organised struggle! From the Sindicato de Estudiantes and Izquierda Revolucionaria (CWI in Mexico) we call for the formation of committees of struggle in every campus and information brigades to counter the silence and lies of the mass media. We also believe that our most powerful weapon is unity with the working class, in struggle against the mega capitalist infrastructure projects which are ruining the country, and with all groups and organisations who are victims of the violence of the system and the state.